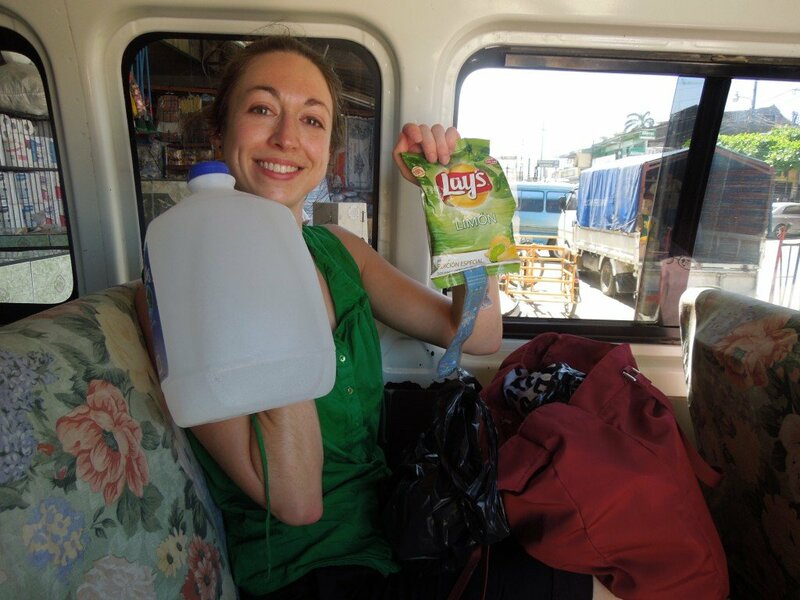 True to form, having taken the night bus up to Tikal in northern Guatemala and gone directly to the ruins on arriving in Flores, my friend Annie and I booked onto a 5.30am shuttle pick-up to get back to Santa Elena, where we took a “second-class” bus to Rio Dulce. It was not uncomfortable but we had the by now familiar late departure with countless stops to drop people off, pick people up, and to get breakfast from various street corners along the way. 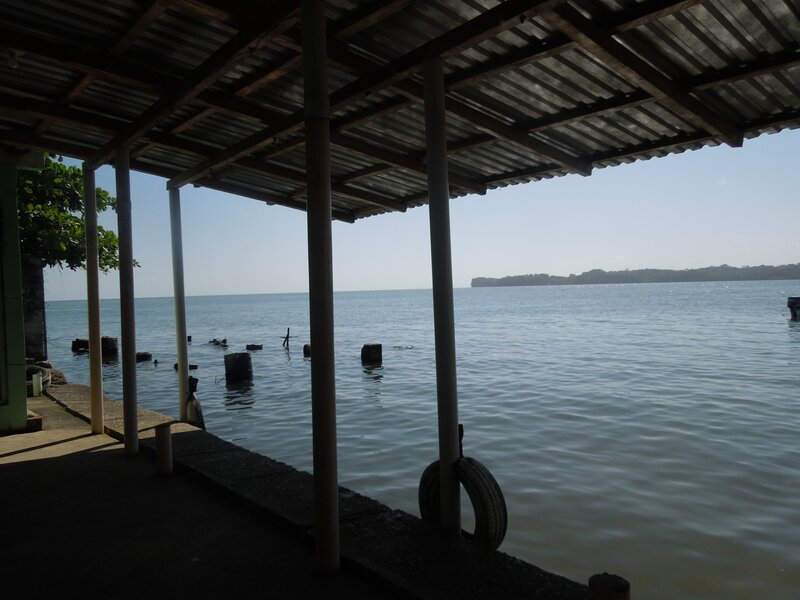 In Río Dulce (it sounds more tempting than it is), we had a traditional cheeseburger-and-fries lunch at the Río Brava restaurant and booked onto a 1.30pm lancha to take us downstream. It was very hot but there was a welcome breeze from the river. A lancha, from the Portuguese word for “barge”, is a motorboat. The journey down the river took a little less than two hours with no stops, passing by what looked like luxury beach huts and thick jungle in between. It’s possible to take the journey in either direction, and travelling by boat is in fact the only means of transportation to and from Lívingston, which lacks road connections to the rest of the country. Arriving in Lívingston, we were met with the usual “Hostel? Hostel? Taxi? Taxi?” but continued up past the docks where we checked into a triple room – we only paid for a double as long as we didn’t use the third empty bed – at the Río Tropicales. Yes, everything here starts with Río. We headed back down to the harbour where we had coconut coffee and settled down on the pier to enjoy the afternoon sun. Lívingston was quite different to the other areas of Guatemala we had visited – Guatemala City, Antigua, Atitlán, Flores. This is the hometown of the Garífuna people, descendants of the “Black Caribs” as the British called the Central and West Africans brought to the continent as slaves. Lívingston is also home to the Rastafarian minority within the Garífuna, which as you might imagine gives the town quite a special vibe. At this point, we had a bit of an itinerary crisis. As you may have noticed from the last few posts, we were travelling at quite a pace, spending just one night in each place before quickly moving on to the next destination. This was pretty tiring but it was a situation we had created for ourselves given our arrival at one end of Central America and our planned departure two weeks later from the other end. To be honest, it’s not something I’d recommend. Having said that, if you’re in a full-time job with just a few weeks of vacation each year then you don’t have a lot of choice, assuming you want to do a good bit of travelling and not just lie on the beach. In any case, we finally agreed to keep moving and hoped to be able to slow down a bit in our second week. If you look at a map, you’ll see that Lívingston is actually very close to the southern border of Belize, and you can take a lancha across to Puerto Gorda or, in fact, to La Ceiba and then on to the Honduran Islas de la Bahía where the diving and snorkelling is meant to be amazing. 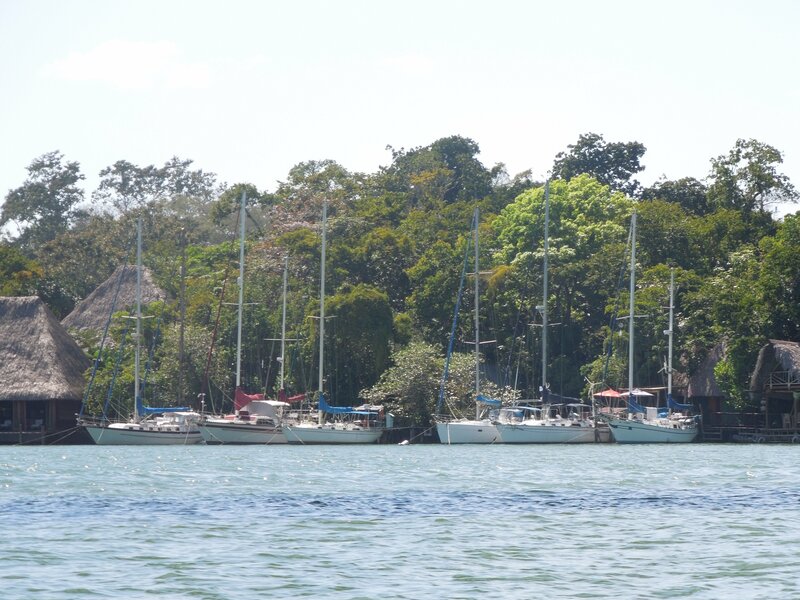 We were headed in a different direction, and once 15 people had gathered to fill the boat, we took off on another course, across to Puerto Barrios. 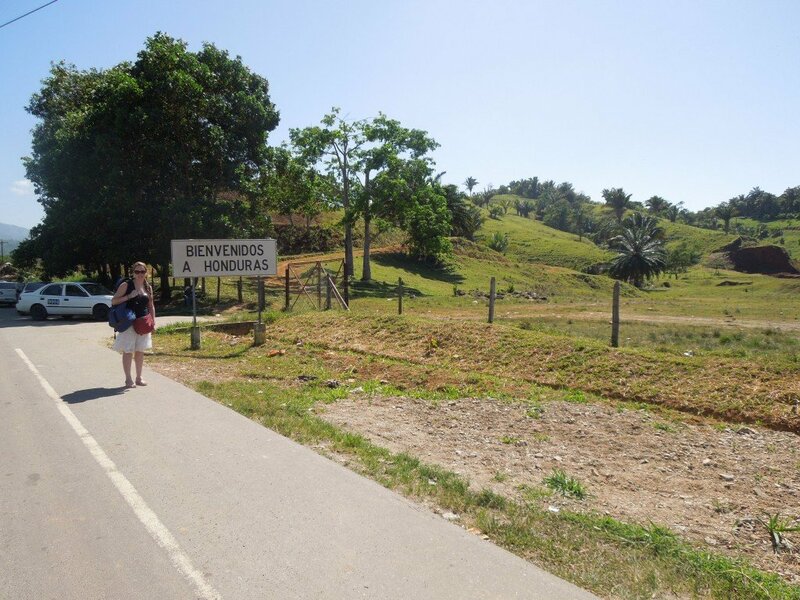 From there, we would travel into our second country, Honduras. 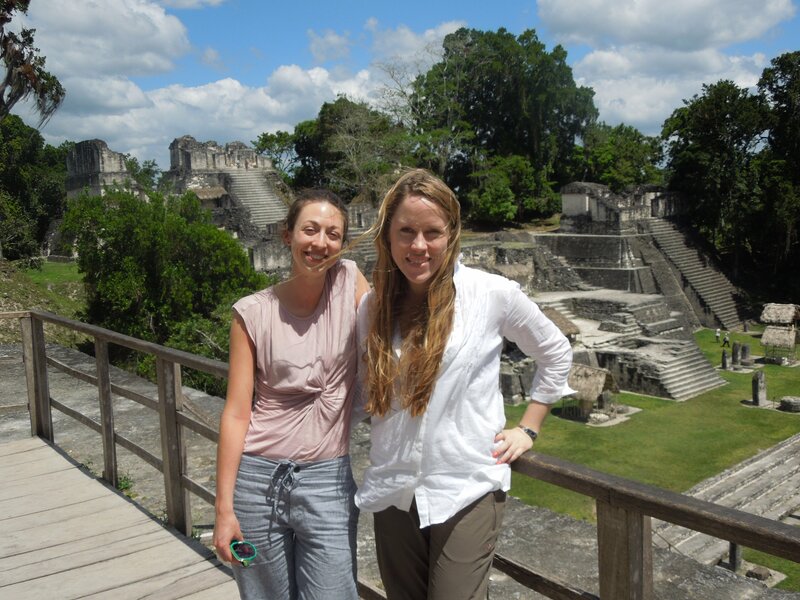 Having started our journey in the south of Guatemala – Guatemala City to Antigua to Atitlán – my friend Annie and I had been umming and ahing about whether or not to head up north to Tikal. These ruins, one of the largest sites of the pre-Columbian Mayan civilisation, had been described by our contacts as “unmissable”; but including a visit to Flores, the closest town, in our trip would mean a detour almost up to the Mexican border before heading back down again and across two or three more countries still to reach our flights out from San José, all in the space of ten days. 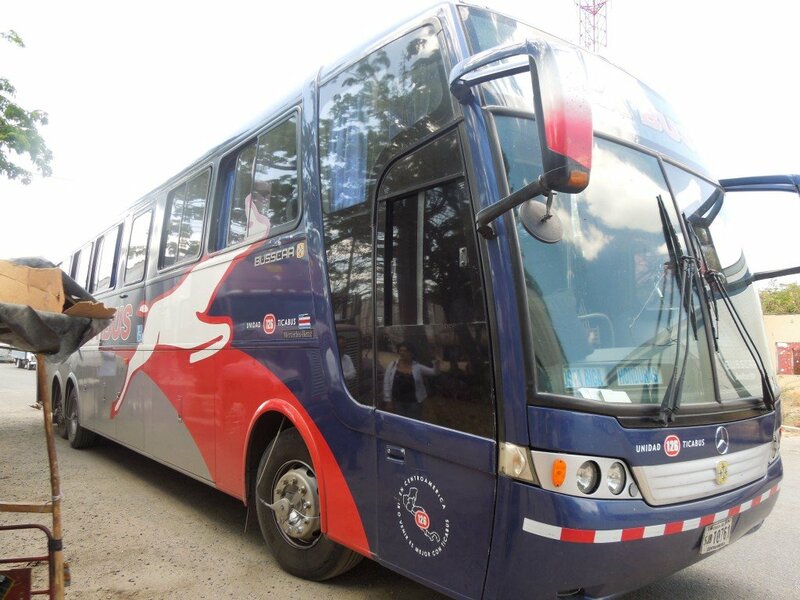 Flights would be expensive, buses time consuming. So we opted for this one night bus that was deemed safe, saving us the cost of one hostel night while getting us up north without “wasting” the day trapped on a bus. From Panajachel on Lake Atitlán, we booked onto a mini-bus to take us (via Antigua for some reason) to Guatemala City, where we arrived in the dark almost five hours later. There we waited at the bus station for our “deluxe” night bus up to Flores, leaving a little after the scheduled departure of 9pm. Now for our first experience of night buses (and the last, in fact, although a year later I was to repeat the experience a few times in South America), it could have been much worse. With my earplugs and eye mask, I actually got quite a bit of sleep. Unfortunately the entertainment system was set to repeat the same old American film over, and over, and over – dubbed into Spanish, of course – so poor Annie eventually had to go and ask the driver to turn it off. 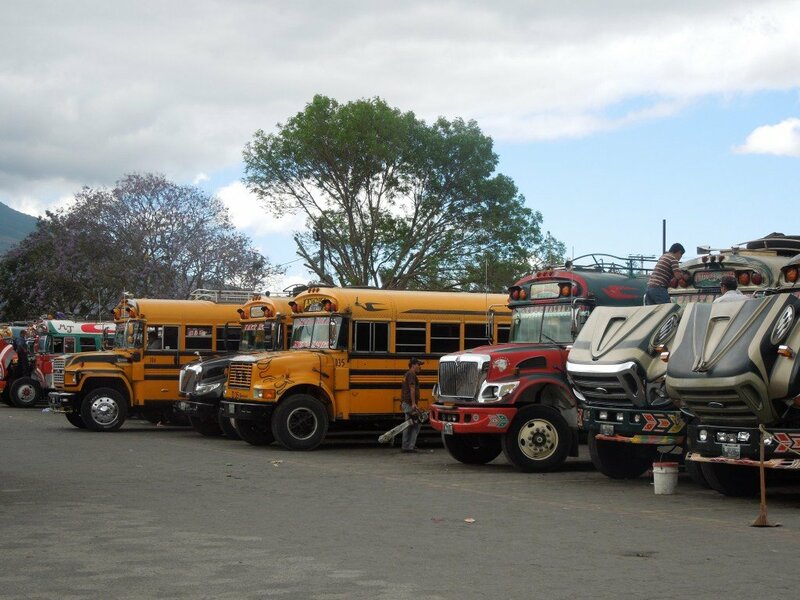 And every time the bus stopped in the middle of nowhere I would wake up abruptly and imagine gunmen climbing on board. This is one of those times when having an active imagination is not such an advantage. Thankfully, the gunmen stayed in my imagination. With my very limited Spanish at the time, though, it was quite an uncomfortable experience as we never knew what people were saying around us. At one point, we all had to get off and it turned out we were to show our passports, along with visiting the toilets if needed. Usually you get by if you just do what everyone else is doing…! In any case, we survived the journey and arrived in Santa Elena around 6am, still pitch black all around us. Flores is actually on an island across from Santa Elena and apparently the bus would not take us all the way. After some hesitation, we had no choice but to get into one of the unmarked vans waiting there at the otherwise empty bus stop, and ask the driver to drop us off at Los Amigos hostel in Flores. Ah the adventure of travel. Alas, the reception didn’t open until 7am but we had a bit of luck when someone inside the gate saw us and let us in. We sneakily had a shower while waiting and eventually got a room when reception opened. Super efficient as ever, we immediately booked onto an 8am bus to take us to the Tikal ruins. We didn’t get a guide but we had a decent map and spent a good four or five hours wandering around (at the end of which we were pretty hot and water-less). I’m so glad we decided on the detour, though, as these ruins really were spectacular. 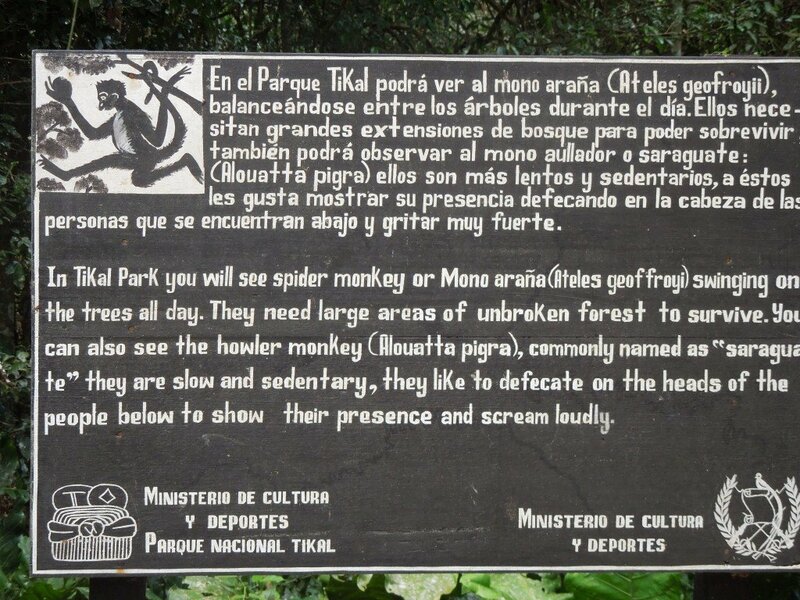 They will have been my first pre-Columbian ruins, so that’s always going to be extra special. We took a 2pm shuttle back to the hostel (a quick visit, in the end, but plenty of time to explore!) and had a lovely relaxed afternoon after another shower. So I’m cheating a little here, because I’m not actually in Central America. I’ve found my notes from my trip two years ago (see? cheating!) 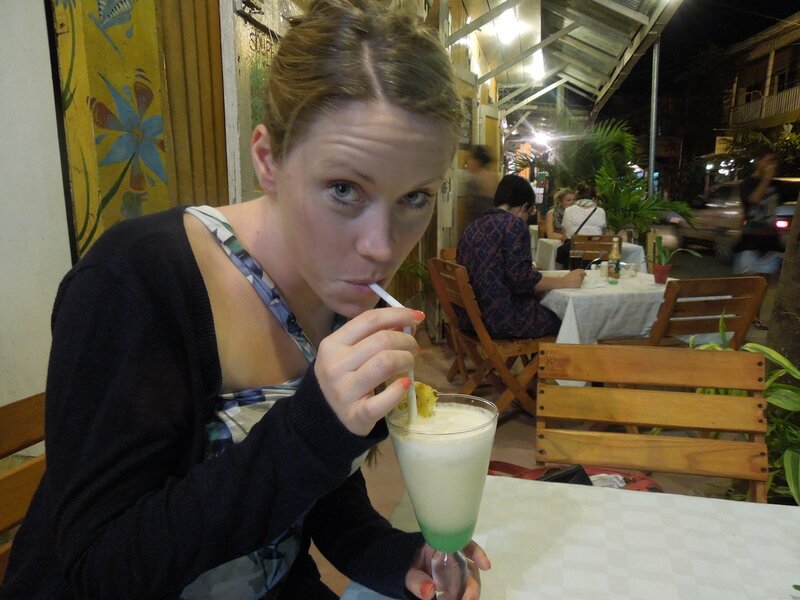 and since I didn’t have a blog back then I thought I’d share my experiences now. 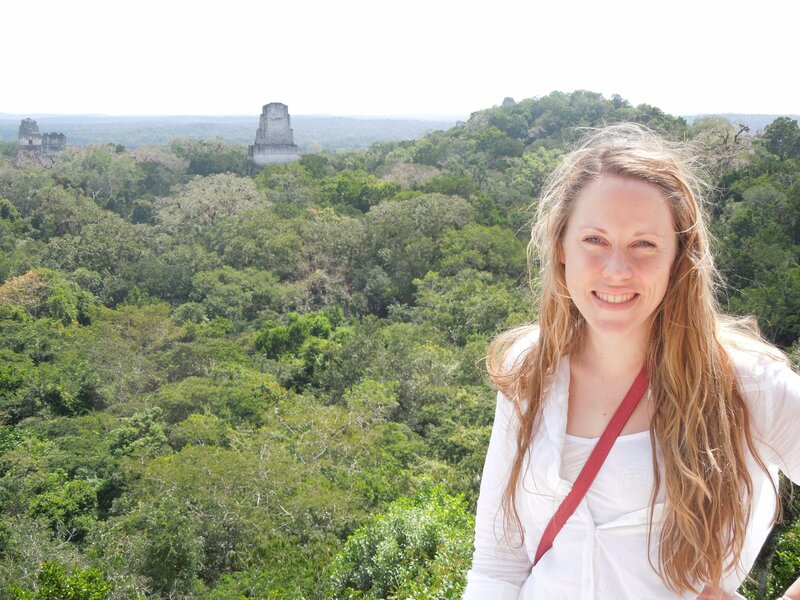 This trip was really a precursor to last year’s sabbatical in South America, though I didn’t know it at the time. It reminded me of how much I love this kind of travel (how could I have forgotten?! ), reassured me that I’m not too old for backpacking (never! ), and gave me a much-needed break from PowerPoint (ahhhh!). The choice of Central America was mainly the result of trying to match affordable flights for my friend Annie, who was coming from London, and me coming from Geneva. That’s how we ended up with arrival in Guatemala, departure from Costa Rica. 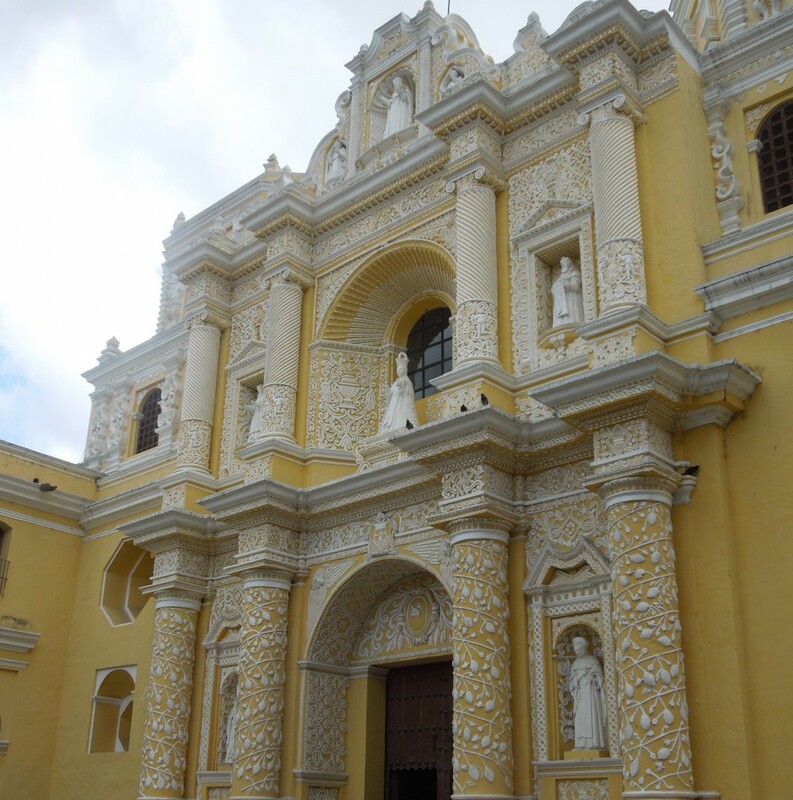 Having booked the flights, we were very relaxed and didn’t really plan anything, until suddenly, as the trip approached, I began to think that maybe we needed a rough idea of how we would get from Guatemala City to San José in two weeks. Yep, four countries (albeit small ones) in two weeks. So of course I consulted my Lonely Planet and realised that we would need to make some choices and move quite quickly if we were ever to make it home. I ended up with a table with five different options that could be mixed and matched to see as much as we could within the framework of certain deadlines. Doesn’t that sound like fun? After meeting up at Guatemala City airport, we headed straight out to Antigua, a UNESCO Heritage Site located between three volcanoes about an hour away from the capital. 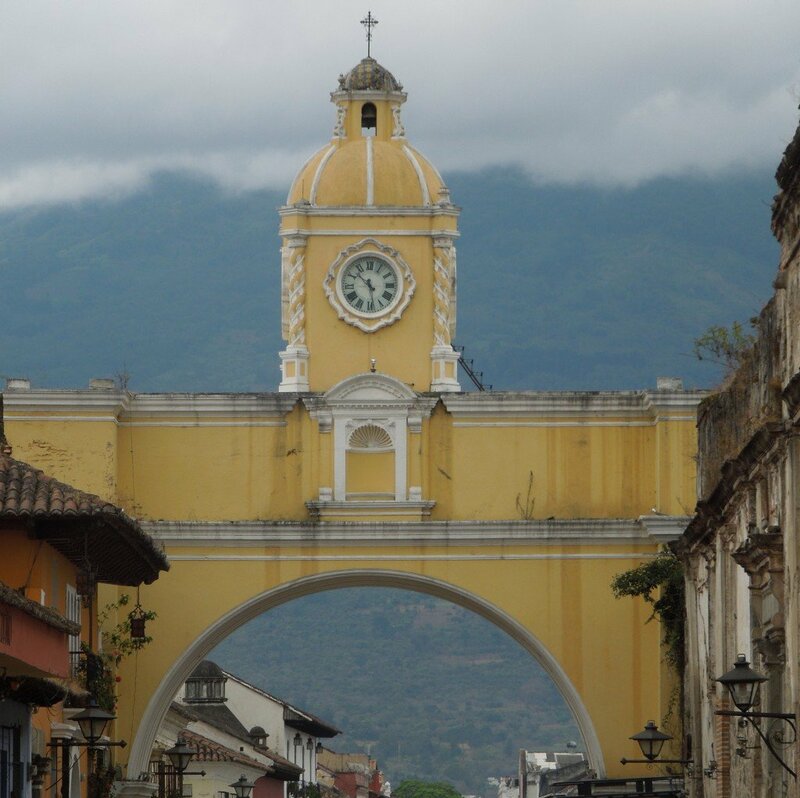 Originally one of the colonial capitals of the Spanish Empire, it was abandoned after an earthquake in the late 18th century and became known as Antigua Guatemala. So in Old Guatemala we spent our first night, the following morning enjoying a “traditional Guatemalan breakfast” consisting of omelette, black bean purée, avocado, fried plantain, cheese, and toast, and then a wander through the colonial streets. 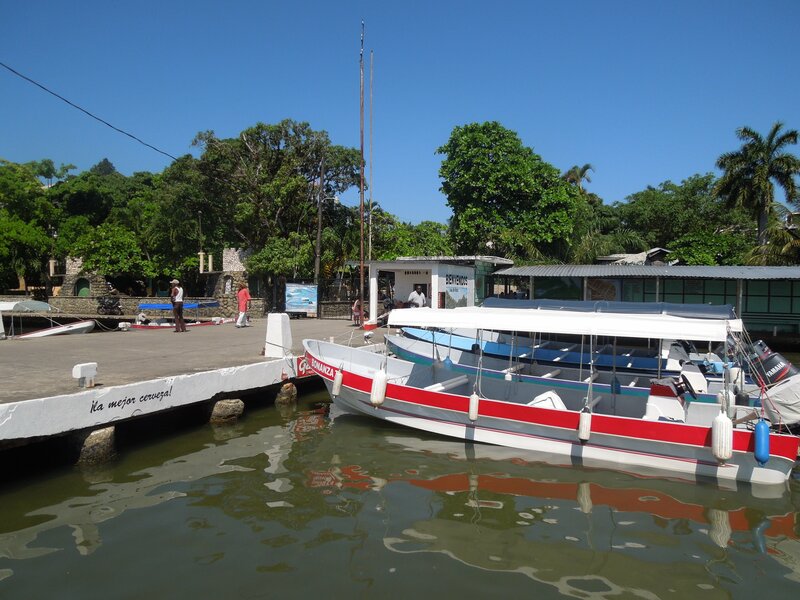 From Antigua we took a bus out to Lago de Atitlán, the deepest lake in Central America. 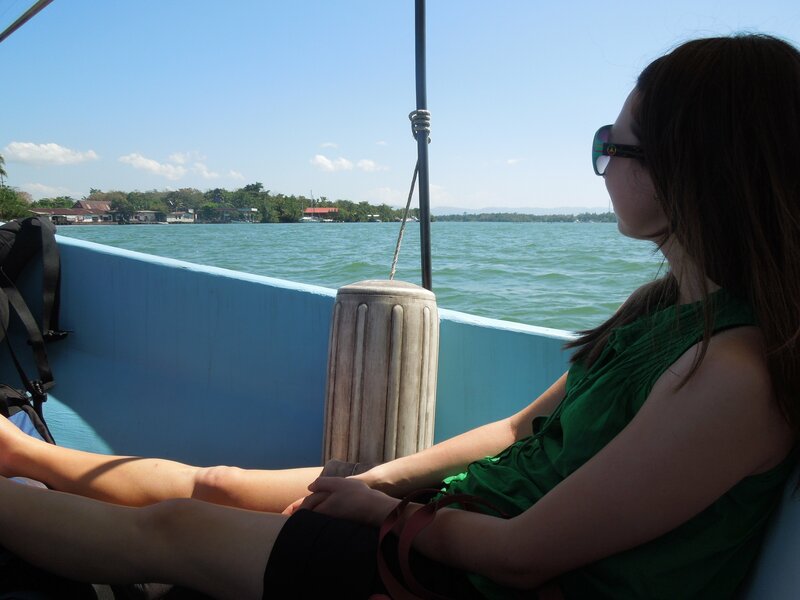 We had heard great things about this lake, promising to be a really beautiful location with a choice of small towns around its shores on a scale of all-night parties down to yoga and meditation. You may indeed need meditation when you come straight from a Northern European corporate environment to be faced with the slow pace that seemed to be the norm here. Timetables were more like guidelines, really, and you have plenty of time to practise deep breathing exercises as your bus drives around town forever picking up more passengers than you could possibly imagine would fit into the vehicle, or you wait in a little lancha that you hope will eventually take you across the lake to your hostel. I adapted quickly, though. 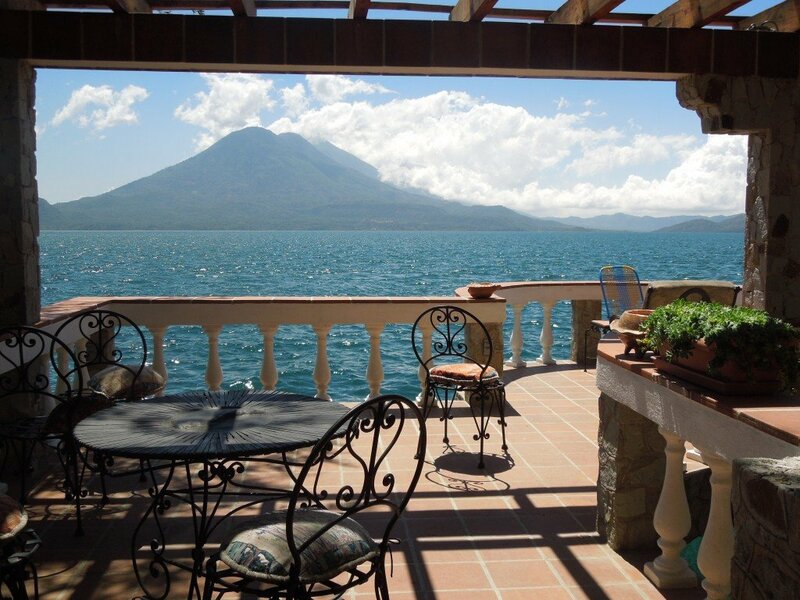 And here, at Atitlán, I found peace. 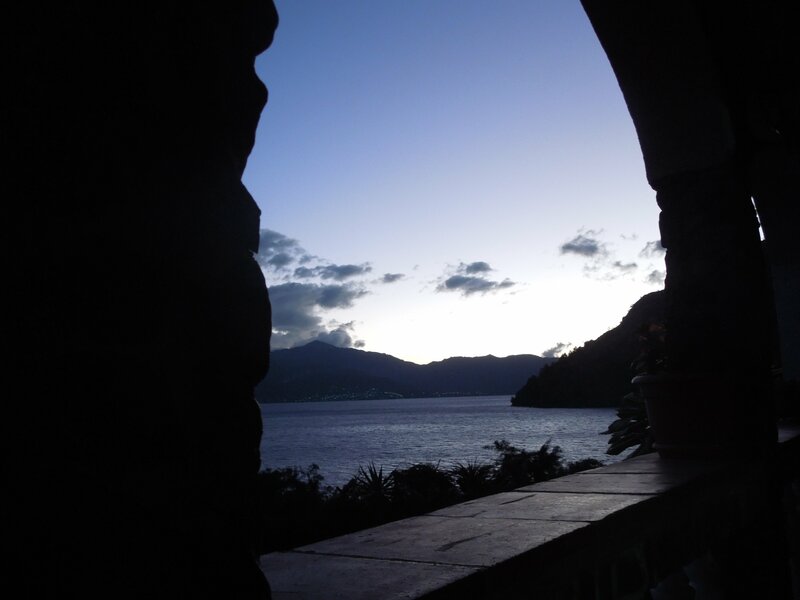 For many months after I returned to Geneva, when things got to be too much, I would just close my eyes and journey back to Atitlán. Lying in my hammock, looking out over over the lake and the surrounding mountains. And at night, the stars. Oh how I love the stars. 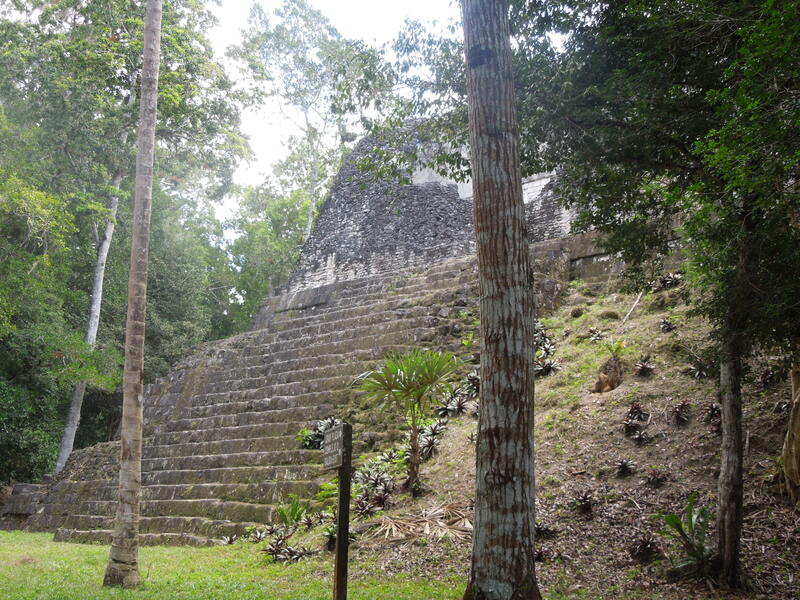 Next week: the Tikal ruins in northern Guatemala.